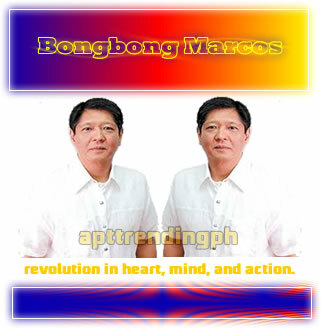 Bongbong - Revolution in heart, mind and action. October 5, 2015, Marcos announced his candidacy for vice president as independent. Born September 13, 1957 now 58. Having been in public service for over 25 years. During this term, one of the important pieces of legislation he authored was the Philippine Archipelagic Baselines Law (Republic Act No. 9522). Senate Committee: Chairman of Committee on Local Government and the Committee on Public Works. He is married to lawyer Louise Araneta-Marcos with whom he has three sons: Sandro, Simon & Vincent. Piece of lines during his speech in ASIA CWO Talks, Marriott Hotel. My vision of our country is one that can overcome its economic and social challenges by drawing on our own strengths and drawing on our unity. It is a vision of the Philippines that is prosperous, rich in opportunity, and home to happy, morally upright, and productive citizens whose lives are meaningful because theirs is a just society, because theirs is a nation that has become great again. I will immediately work to restore in all Filipinos the lost sense of pride in themselves and pride in being citizens of the Republic of the Philippines. We had at some point in our history that pride, that sense of nationhood but we see it to have gone astray and we have lost it.This administration should govern our country with special attention to the needs of the more than 26% of our population who are the poorest, and the almost 70% who are called "unpoor" but actually mean that they live only precariously above the poverty line. And that, ladies and gentlemen, is where you come in. I believe that in a meritocracy, the rule of law becomes second nature. In a meritocracy, we can focus on the real answer to that question: What would I do if I were president? Strong nations need strong foundations, and a successful presidency must emphasize service to the vast majority of our people – not in handouts, but in opportunities to easily join the meritocracy where we can build together.